Apra’s state-of-the-art facility in the GTA (General Toronto Area) is a fully fenced and secured yard with over 7 acres outdoors and 50,000 square foot indoor warehouse that can handle any of your warehousing needs. 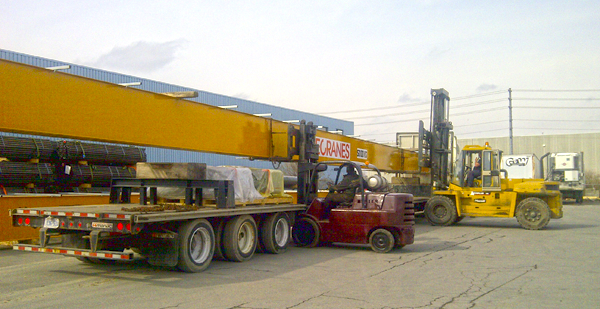 We have 40’ ceilings, indoor cranes and forklift equipment that can handle cargo weight of over 30 tons along with a fleet of smaller forklifts ranging from 2,000 lbs capacity to 25,000 lbs. Apra Warehouse can arrange expert packing or crating of your goods, storage and container loading for cargo destined for overseas or we can arrange to transport these goods throughout Canada and the USA. We’ll arrange all required permits, transport escorts or police escorts in order for your freight to arrive safe and sound and on time.